The Malvern Autumn Show – This Weekend! Do you have any plans for the weekend? If you’re at a loose end why not pop along to the Malvern Autumn Show at the Three Counties Showground in Malvern. The show takes place on 29 September to 30 September and it’s a great way to spend the weekend with family or friends. What’s on at the Malvern Autumn Show? There’s always plenty of fun to be had for all the family at the annual show. Enjoy delicious food and beverages while you explore the showground. The UK National Giant Vegetable Championship is always entertaining, with homegrown fruits and vegetables that are all Instagram worthy. Spend some time seeing how life used to be like in the Vintage Village, a great opportunity to show the kids what life was like for you or their grandparents with retro electrical items on display. It’s always great fun to encourage them to imagine what life would be like without the Internet or Smartphones. Gardeners will not fail to be inspired by the exhibits from the RHS Flower Show. Explore the beautiful gardens and treat yourself to some new, top quality plants from some of the most talented, award-winning nurseries in the county. There are plenty of beautiful plants to choose from and it’s a great opportunity to seek some advice from the experts on hand. Don’t forget to eat well to give you plenty of energy to experience everything the show has to offer. 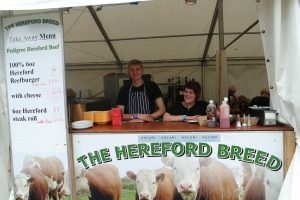 Gather the energy by treating the family to something off the menu at the Hereford Beef Society stand. You can sit down to eat a delicious steak or perhaps you’d rather eat a Hereford beef burger while walking around the stalls. There’s something for everyone. This is also a great opportunity to learn more about Hereford beef. Learn more about the Malvern Autumn Show and buy your tickets on the Three Counties Showground website.